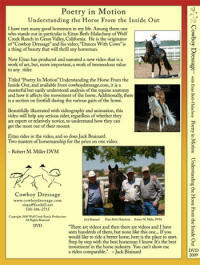 If you enjoyed viewing a Cowboy Dressage Video on RFD-TV or Horse -TV please let them know! 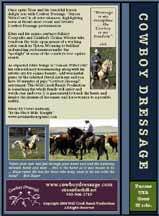 For the Cowboy Dressage rider both old and new riding a straight line can be challenging. The straight line is the first and last impression that we make before we salute the judge at the beginning and end of our test. Finding the midline and sticking to it is the key to making the right impression and getting that perfect 10. In this short video we will explore how the Cowboy Dressage Challenge court can help both horse and rider to find their center. We use small circles to help the horse strengthen and supple one side at a time to become straight as he travels. The Challenge court provides several opportunities for riding straight lines and all of those lines are demonstrated by horse and rider as well as through helpful diagrams. We will discuss simple changes that can make a big difference to your success finding the line of travel on the court. So, saddle up and join us on the Challenge Court as we learn to travel the straight and narrow path! 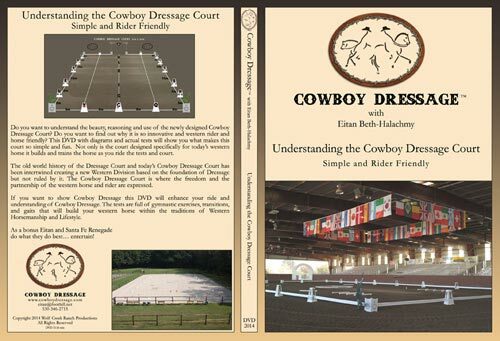 Do you want to understand the beauty, reasoning and use of the newly designed Cowboy Dressage Court? Do you want to find out why it is so innovative and western rider and horse friendly? This DVD with diagrams and actual tests will show you what makes this court so simple and fun. Not only is the court designed specifically for today’s western horse it builds and trains the horse as you ride the tests and court. The old world history of the Dressage Court and today’s Cowboy Dressage Court has been intertwined creating a new Western Division based on the foundation of Dressage but not ruled by it. The Cowboy Dressage Court is where the freedom and the partnership of the western horse and rider are expressed. 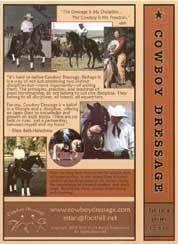 If you want to show Cowboy Dressage this DVD will enhance your ride and understanding of Cowboy Dressage. The tests are full of gymnastic exercises, transitions, and gaits that will build your western horse within the traditions of Western Horsemanship and Lifestyle. do what they do best… entertain! The Cowboy Dressage horse is not a dressage horse. He is first and foremost a Western horse in conformation, movement and temperament that is enhanced by the foundation of dressage, not ruled by it. This DVD clearly explains the 3 natural gaits of the Cowboy Dressage Western Horse. 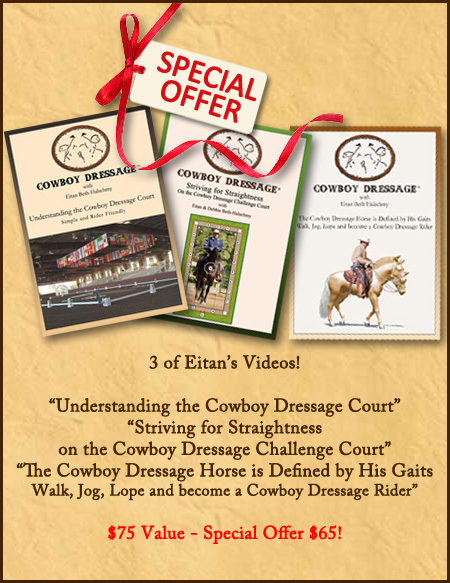 Eitan uses animation and actual tests to show and explain the needed movements, balance, carriage, cadence and frames that are desired in Cowboy Dressage. 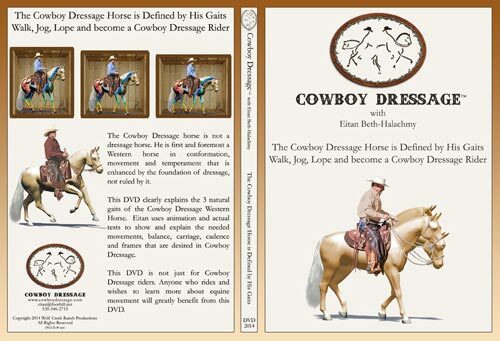 This DVD is not just for Cowboy Dressage riders. Anyone who rides and wishes to learn more about equine movement will greatly benefit from this DVD. Famed horseman, artist and teacher, Eitan Beth-Halachmy brings to life a beautiful and highly educational DVD, as promised , "Poetry In Motion II, "The Partnership" is a continuation of Eitan's highly acclaimed "Poetry In Motion I, Understanding the Horse From the Inside Out". Like his horses "The Partnership" is a work of art. 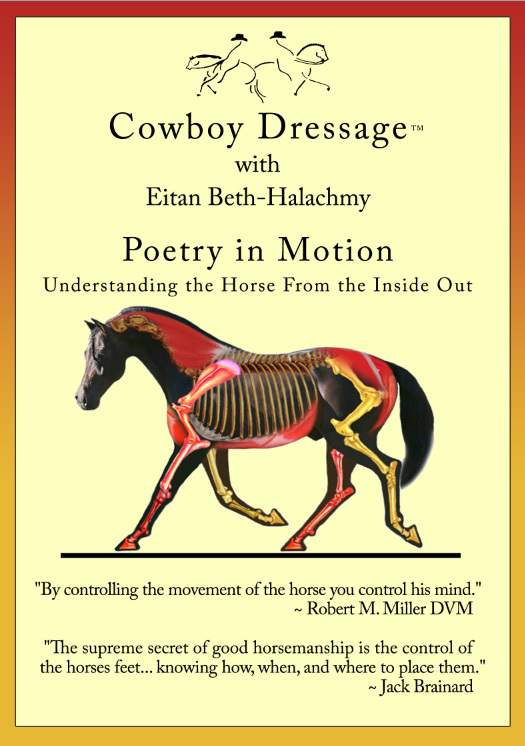 Eitan shares how he creates his trademark, "lightness" through the use of the: Circle of the Aids, Control of the Horse's Body Parts, Straightness and Bends. With the use of beautiful videography, diagrams, music and animation, Eitan makes the educational experience easy to understand and a joy to watch. It will not only enrich but inspire those that seek clarity and finess in their horsemanship. "The Partnership" is a blend of simplicity, simple truths and time tested basics that will aid any horseman or horsewoman in their horsemanship journey. There are videos and then there are videos and I have seen hundreds of them, but none like this one. If you would like to ride a better horse, here is the place to start. Step by step with the best horseman I know. It's the best investment in the horse industry. You can't show me a video comparable.".... Jack Brainard "
This Poetry In Motion DVD is "student friendly"
with menu and chapter selections for easy review and learning. 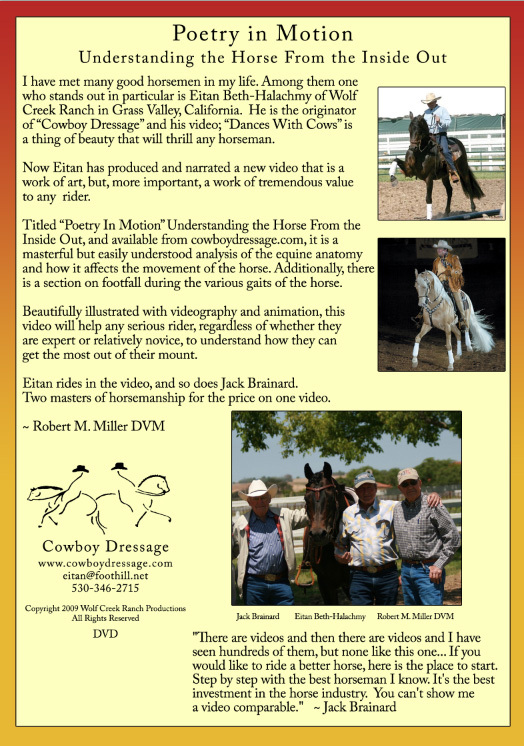 The only thing that is better than Eitan's Book COWBOY DRESSAGE "Understanding Horsemanship From the Inside Out" is his DVD video "POETRY IN MOTION, "Understanding the Horse From the Inside Out". . .
Click Here to see his book. Cowboy Dressage "Dances With Cows"
Cowboy Dressage, "Dances With Cows" will be available to the public in early fall of 2004. Eitan feels this is his most beautiful video to date. This video is not a training video but an entertainment video. If you enjoyed The Best of Cowboy Dressage, "The Music and the Magic" you will love "Dances With Cows." This beautiful Wolf Creek Ranch production is "eye candy" for any horse lover. This new production highlights Eitan's best performances with Holiday Compadre and Golden Warrior. From "spotlight performances to working with cattle in Upton, Wyoming" this video is a visual equine masterpiece. Cowboy Dressage "Building the Foundation"
"The Dressage Is My Discipline.. The Cowboy Is My Freedom"
Eitan has long been known for his unique style of horsemanship. In this video Eitan discusses control of the three parts of the horse's body, the importance of forward motion and much more. Beautiful horses, beautifully done, always entertaining and inspiring! Eitan takes you step by step through his early training basics under saddle. He also shares his wisdom, philosophy and of course his humor. The horses are stunning and the settings full of color and beauty. He takes you from his home at Wolf Creek Ranch to the Red Rocks of New Mexico sharing with you his training methods and practices. Like so much of everything else that Eitan does this video is sincere and straight forward. His goal is to educate and enlighten. As always you can count on some entertainment and great music. Take an hour for yourself, curl up with a good cup of coffee and prepare yourself for pure enjoyment. 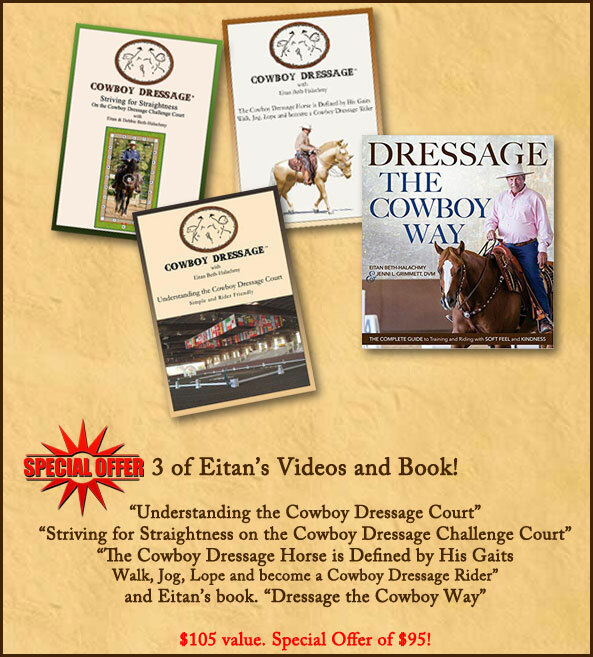 Eitan welcomes you to his world and the magic of Cowboy Dressage. In this dvd you will see all 8 Cowboy Dressage Tests ridden and executed by Chris Newbert and Chico under the direction of Eitan Beth-Halachmy with commentary by Shawn McEntee. 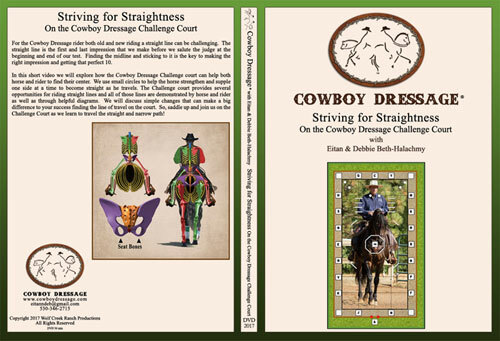 This is a highly informative and visual dvd for anyone who wishes to ride and compete in Cowboy Dressage. Chris and Chico demonstrate the tests one by one and chapters are in place on the dvd to easily find each test.